This page is a collection of posts on the topic of “Portable Children’s Ministry/Portable Church/Church in a Box. The most current post is noted first. To set the rooms back up exactly the way the teacher left it, we make a note of the placement of desks and other furnishings on the classroom white board. Often times, students have left posters on desks, school books, etc. Everything is noted and placed back in its original place. Smart phones are used to take a photograph of the class, especially helpful for a very detailed arranged classroom. It’s important that we respect all of the supplies and classroom resources. This earns our trust with the teachers. We have an incredible team of men and women that help set up children’s ministry every week. There are four set up teams that serve for one month three times a year. We established a system that enabled the set up process to be completed in record time. We especially wanted to make it very easy for the newbies on the set up teams to quickly adjust to the set up process. Our goal was to have everything ready a minimum of 15 minutes before families and first time guests arrived. Set up team arrives at the location about 20 minutes before the trailer arrives with the supplies. They map out the rooms, photograph as necessary and begin moving desks. They are careful to create a barrier of desks in front of the smart boards to discourage little people from exploring that area. By the time the rooms are prepped, the trailer has arrived. We established this policy: “The classroom you set up is the classroom you put back in order.” This helped to maximize efficiency and organization at the end of the morning. Remember the last thing packed on the trailer is the first thing to come off. We needed the industrial size sweeper brooms and the colored banners off first. Often times the floors needed sweeping before the carpets and mats arrived and if there was a question about where a piece of equipment was to go, we would direct them to “Yellow!” or “Green!”, etc. A supply list for each room and a photograph of how the room needed to be set up was placed beside each classroom door. This helped each team member to work independently with setting up the room. They would look at the photograph and placed things accordingly. The supply list included the number of carpets, chairs, tables, etc needed in that room. It is wonderful to have children accompany their parents and help with setting up. Those colored banners, colored labeled boxes and photographs of the classrooms made it easy for the elementary age kids to work independently too. All of the bins and smaller supply boxes were stored inside large carts. Each cart is labeled with a designated location (Preschool, Elementary, Administration.) Members of the set up team are assigned an area to set up for the duration of their rotation (one month). This also helped us to be more efficient with setting up and packing up the environments. Carpets were placed in the rooms first and vacuumed. Vacuum cleaners, cleaning products, first aid kits, colored banners and signage are loaded last on the trailer and the first to come off. I’ve noticed that many of you have discovered the wonderful portable rocking chair to use in a portable church environment. If you happened to miss reading that post, please go here (A portable church environment–#2) and definitely investigate the options of folding rocking chairs for a “Church in a Box” nursery environment. 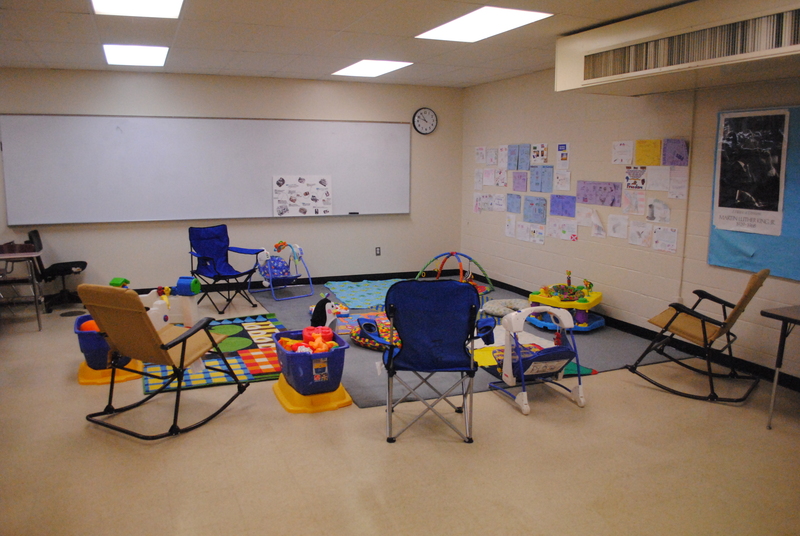 Look at this picture of a sweet environment created for little ones. 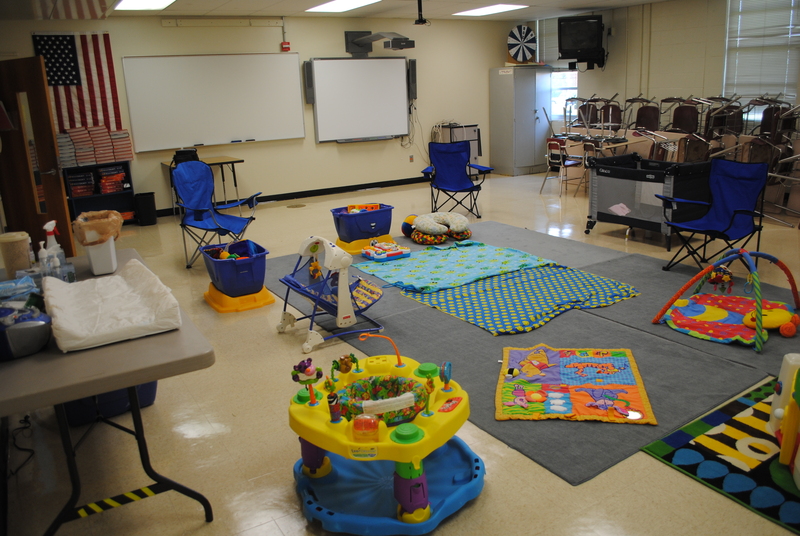 It’s amazing how a classroom for high school students can be transformed into a warm and cozy space for infants and little ones just learning to crawl or toddle about. Don’t forget to have a few pack-in-plays for the babies that just want to sleep. But you know what…those pack-n-plays are seldom used because our volunteers love to rock and snuggle a sleeping baby for the entire hour! (However, you should have that portable bed ready. Because on that one Sunday you decided not to set up the pack-n-play…it will be needed!) This nursery belongs to Church of the Redeemer, located in the Charlotte, NC area. Several weeks ago while vacationing with my husband, we visited Eternal Church, located in Fort Mill, South Carolina. We loved it! We were welcomed with friendly smiles, warm hand shakes and a hot cup of coffee! They were prepared to welcome us…their guests! Eternal Church is a portable church that meets regularly at the YMCA in Baxter Village. The gymnasium floor was protected with floor tarps and hundreds of chairs were set up for worship. I really enjoyed taking a tour of the set up for elementary age kids. It was terrific to see kids meeting in small groups and listening to adults telling them about Jesus. It didn’t matter that they were sitting close to work-out machines. In fact, none of that was a distraction. Portable Church or Church in Box works. I am a fan of church planting and multi church sites. It’s all about Jesus! Why else would a group of people give so much effort to set up church every week? Yes, it’s all about Jesus…plus relationships and don’t forget the coffee! Tip #2: Purchase portable rocking chairs for your nursery. Our volunteers are happy and especially our Moms! Here is a photo of the chair I purchased and the link to Camping World’s website. The price is just right for a tight children’s ministry budget! Because we enjoy setting up this portable church. Because we love to worship Creator God. We love families. We love kids. We have been meeting in the high school for more than ten years. We continue to expand into more classrooms, lobby space, media center, outdoor green space, cafeteria…it’s amazing how fast we are able to set up our church in just a few hours. It’s amazing how fast we are growing. We are ready. Ready for everyone. Ready to worship and celebrate Jesus with children. Here is a tip: Chart the design of the classroom layout before moving the desks against the wall. This will help with setting the classroom back in its original design. Also, purchase industrial style brooms and several dust pans to clean the floors before carpets and toys are placed in the room. This is a photo of a nursery environment. I’ll post more photos and suggestions for setting up a portable church environment in future posts. Portable Children’s Ministry: Thank You Redeemer Kids! These many gifts were given to me, on a harried and busy Sunday morning. I always wake up Sunday morning before the sun brightens the sky. Waking up to a fresh brewed pot of coffee that Don set to brew the night before. I enjoy a cup of coffee on the deck while I listen to the bird’s wake up calls and I talk to God about my expectations regarding the next few hours. I tell Him that I am addicted to stress and anxiety and perfectionism and fear that something will go wrong and that I am expecting to be totally exhausted by 1:00 PM. I slurp down the last drops of coffee while the sun begins to brighten the morning sky and gently flushes my face with its radiance and I am reminded by the continuity of the sun, by Creator God, that all things are YES in Christ! I am free from these addictions because of Jesus death on the cross. My husband makes breakfast for me. He helps me load the car with all of the other stuff needed for children’s ministry. He opens the car door for me. He hands me a mug of coffee for the ride to church. We arrive at 7:50 A.M. Servant leaders, men in our church, sweating in the early morning hours of heat and humidity have begun unloading a trailer filled with supplies for children’s ministry. The trailer is empty. They are preparing for children to arrive. We are working together…to do this task week after week so that children will hear awesome truth from God’s book, to learn about Jesus, to play, laugh, explore, sing, dance and worship the Lord. The men are unloading the large wooden carts packed with lots of bins filled with toys, blocks, bibles, and resources and portable pack-n-play cribs, carpets for every room…everything needed for Sunday morning ministry to children. While we are setting up the children’s rooms, there are men and women patiently setting up the school auditorium for worship. Families begin arriving. Children are laughing. Volunteers man their stations with smiles and eyes sparkling. They arrive on time! Everyone is eager to help. Several fathers step out of their comfort zone to dress up like wild and wacky pirates…to tell kids about an awesome treasure that God has for them. Parents have gathered around to watch and listen, children are laughing and engaged, volunteers are loving this time with children. And I am observing all of this. I am laughing. I linger by the classrooms and listen to the language of the gospel being shared in a variety of ways. Children and Shepherd Leaders in small groups, huddled close, exploring details of this treasure God has for us. I peek to watch babies being snuggled and cared for, toddlers playing and 5th graders reading verses from God’s book. I am amazed to experience God work. I am humbled by the reality that I am included in all of this. The halls are filled with parents coming to pick up their children. It is now time to go home. Hungry children and ravenous teens are ready to bolt for the dinner table. The fellowship lingers, however, as families greet each other outside the classrooms while volunteers are sharing about the fun things they did that morning with children. While this is going on, the Servant Leaders are pulling out the large wooden carts and helping to pack up bins and fold up the camp chairs and carpets and pack-n-play cribs and empty trash cans…we are packing up for next Sunday. Two women, two servant leaders , pack these large carts. Every week they pack the carts. The time on my watch reads, 1:00 P.M. And my task is done. I am ready to go home to the dinner table. But the Servant Leaders have not finished packing the trailer with those large wooden bins and all of the rest of the stuff that is piled outside waiting to be loaded in that trailer. They will continue to serve this church for another hour. Don and I drive home. We talk about the morning and things we learned. I realize that I’m not exhausted. I feel refreshed and content. I begin to silently pray to Creator God…thanking Him for these gifts. This is a gift. 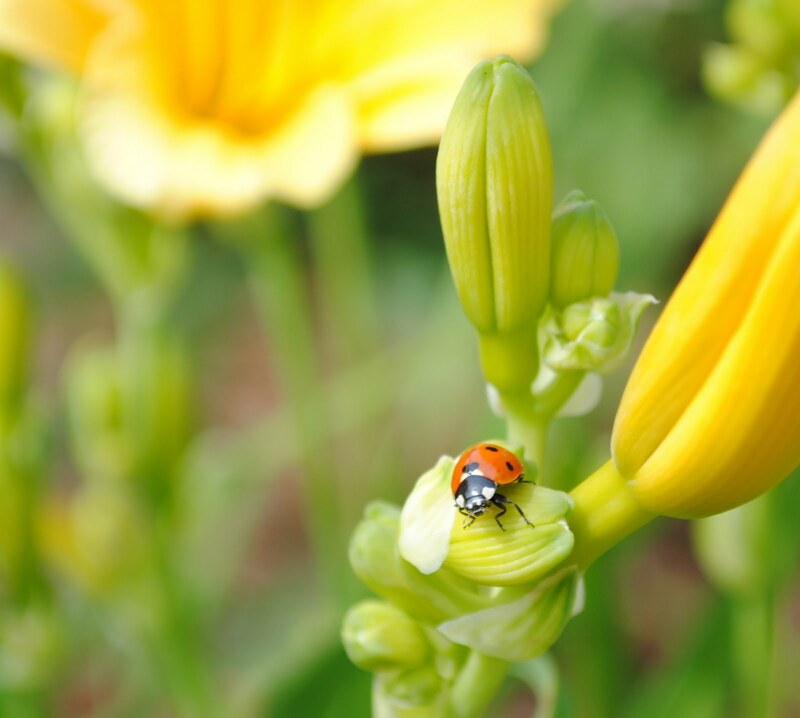 To see a little bug doing what Creator God created it to do.